Sierra TopTrak - 820 - Mass Flow Controllers / Meters - Mass Flow Meters by Sierra Instruments, Inc. The TopTrak 800 series provides an economical OEM gas mass flow meter in your choice of nylon, aluminum or stainless steel. Direct mass flow rate measurement with the nylon version at prices below that of a typical rotameter. Large tiltable display that can be mounted on the device or on a remote panel. Large cleanable sensor tube for use with dirty gases. Ask about OEM volume discounts on pricing to meet your budget requirements. For fast delivery, buy online and get next-day shipment. From bulk gas delivery to cleaning to purging operations, Sierra`s mass flow meters and controllers offer the simplicity and robustness demanded in these applications. Our ability to handle corrosive gases, high flow rates and multiple gases with the same unit makes Sierra`s mass flow meters and controllers a tool-makers choice. Most chemical reactions are based on direct mass flow readings, and thus, Sierra`s immersible thermal mass flow meters and our volumetric vortex and multivariable mass vortex flow meters see extensive used in oil, gas and steam measurement. In addition, process liquid flows can be addressed with our non-intrusive clamp-on ultrasonic flow meters. Finally, our capillary thermal mass flow meters and controllers are perfect for semiconductor processing applications. Supporting research and production worldwide for over 40 years. Mass flow meters and controllers give you the advantage with precision data and application flexibility. Our mass flow flow controllers are used in a wide variety of analytical tools ranging from chromatographs to gas mixing and blending systems to assure precision gas mass flow rate delivery. Our mass flow controllers in particular see extensive use in bioreactors, pill coating and the creation of artificial atmospheres for research. Our flow meters are used to leak test critical medical devices like stents, while our larger industrial devices are used to heat or steam-clean bioreactors and in facilities management in hospitals. 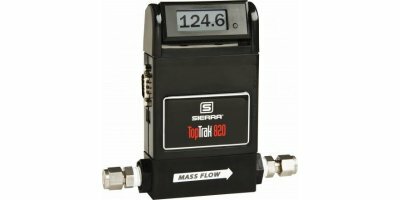 No reviews were found for Sierra TopTrak - Model 820 - Mass Flow Meters. Be the first to review!